Students and activists gathers during a ceremony to mark the 30th anniversary of the 8888 uprising in front of city hall in Yangon on Wednesday. YANGON — Prominent student leaders of the 1988 uprising stressed that Myanmar’s political achievements to date were only a partial victory and called for more democratic reforms on the occasion of the 30th anniversary of the mass protests on Wednesday. 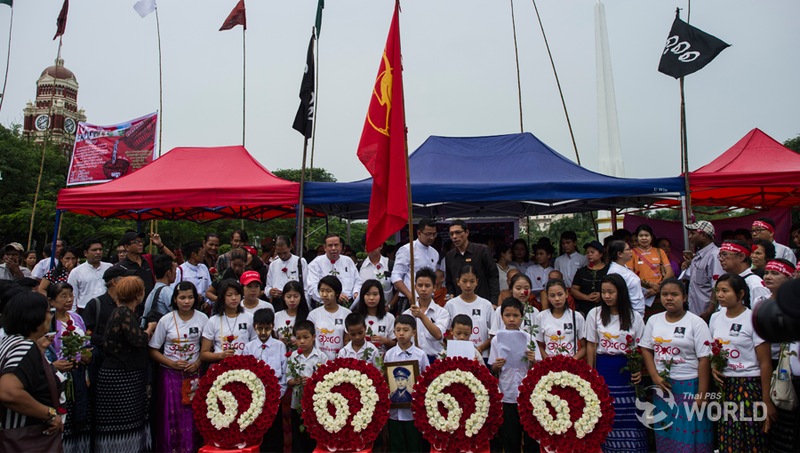 During a commemoration ceremony at Yangon University to remember the popular nationwide uprising against one-party dictatorship, U Min Ko Naing, a member of the ’88 Generation Students group, said the progress Myanmar was experiencing now was not the ultimate goal of the uprising that he joined as a university student. “We have been asked if our demands have been met after 30 years. Having a parliament and elections was not our goal. We will have to work hard for a parliament filled entirely with elected members and for a government made up entirely of civilians,” he told the hundreds of attendees, mostly former students who had taken part in the uprising. Named after the nationwide protest on Aug. 8, 1988, the 8888 — or ’88 — uprising was a major shift in Myanmar’s modern history. Political analysts at home and abroad agree that, despite ending in a bloody military coup, the uprising raised the public’s political awareness, which in turn paved the way for changes that brought Daw Aung San Suu Kyi and her National League for Democracy (NLD) to power 28 years later. Despite the civilian government now in power, Myanmar today is coping with a guided democracy based on a military-drafted constitution and is still accused of being undemocratic. U Min Ko Naing praised the unsung heroes of the uprising, saying ‘they served better than us,” and suggested that the country’s policymakers be aware of the people’s concerns and suffering. “If they know what people need, a better nation is on its way,” he said. For another student leader, U Ko Ko Gyi, the 30th anniversary commemoration at Yangon University was a surreal experience, as many students were arrested there in 1988 not only for protesting, but merely for hoisting a fighting-peacock flag or holding pictures of independence hero General Aung San. “I see today, event here, as a metamorphosis of a 30-year-long journey,” he told the audience, admitting that he was still haunted by memories of fellow students being arrested or killed or going insane in jail. “We are saying this not because we feel bad. We are just sharing that people who were involved in this had suffered like that to have change like this today. It would be an honor for those who are gone and a consolation for those still alive,” he said, adding that he did not want today’s youth to have to go through what they did. He also said the government needed to listen to the voiceless, the discontented and disenfranchised who cannot or do not dare to speak out. “The government in 1988 failed to listen to them and all hell broke loose,” he said. To mark the 30th anniversary of the uprising, Myanmar’s Lower House and Upper House speakers sent formal messages to the event on Wednesday. There was no message from State Counselor Daw Aung San Suu Kyi. The anniversary’s organizing committee personally delivered an invitation to her in Naypyitaw before events began on Monday. She did attend and gave a speech in 2013, on the occasion of the uprising’s 25th anniversary. When The Irrawaddy asked U Min Ko Naing, U Ko Ko Gyi and U Mya Aye, a committee member who invited the state counselor, why she had failed to attend this year, they all refused to comment. However, other members from the NLD’s Central Executive Committee did attend, along with some international diplomats. Yangon-based political analyst U Yan Myo Thein said the lack of a message from Daw Aung San Suu Kyi could prove a black mark on the country’s history. “She is supposed to send it. It’s the uprising that has made her a politician and turned her into a popular leader,” he said.